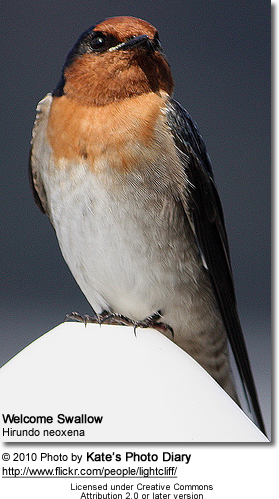 Hirundininae (all other swallows and martins). 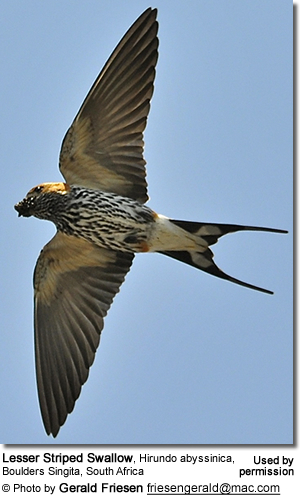 They have slender, streamlined bodies; long, pointed wings and most of them have long tails. Their feet are designed for perching rather than walking. The front toes are partially joined at the base. These small birds are best known for their adaptation to aerial feeding. 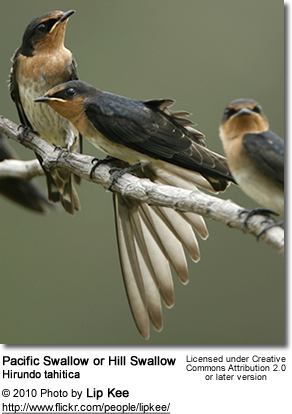 Swallows have aerodynamic bodies that allow them to efficiently hunt insects on the wing. In many cases, these birds will build mud nests close to overhead shelter in sheltered locations. 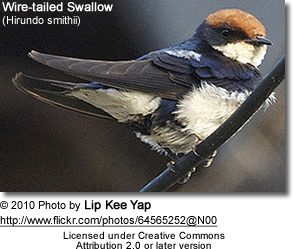 Cave and cliff-dwelling species of swallow typically nest in large colonies. Some will also readily accept regular commercial nest boxes. However, Avianweb visitor John Timm points out the importance of making sure that the nest box entrance holes for swallows is no bigger than 7/8". Any larger, and aggressive nest competitors, such as the English sparrows, will be able to enter the boxes and kill the swallows (adults or young). He explains that swallows can roll their shoulders back to enter the smaller hole, while the larger sparrows cannot. He modified his nest boxes to have entrances sized 7/8" in diameter and has since not experienced any more losses.